Press release Rome 20 September 2018 The National Roman Museum, directed by Daniela Porro, presents with Electa Passi. Palazzo Altemps. 20 September 2018, installation by Alfredo Pirri by Ludovico Pratesi and Alessandra Capodiferro. The work Passi by Alfredo Pirri is an interesting example of relationship with the exhibition space that hosts it, giving it a new perspective from time to time, highly spectacular and appreciated by the public. The artist has now chosen the entrance loggia of Palazzo Altemps. The installation - prepared with the preparatory sketches from 21 September 2018 to 6 January 2019 - creates a fragmented vision, produces a vertigo of the gaze, a kaleidoscope effect but also a feeling of precariousness, provoking a suggestive reflection effect between the vault of the loggia , the courtyard of the aristocratic residence and the sky. A draped female statue is placed on the work, coming from the collection of the Boncompagni Ludovisi Princes and exhibited, until today, in the private residence of the Aurora Casino in Rome. "An exceptional loan, a sign of contamination and continuity with the permanent collection of the Palazzo Altemps Museum dedicated to the history of antiquarian collecting", explains Daniela Porro. 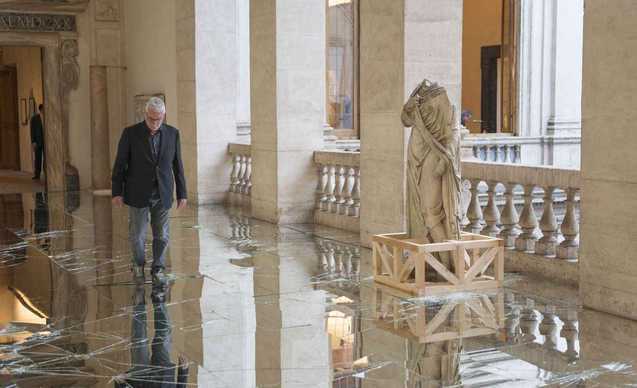 The sculpture brings with it the traces of the garden that has hosted it for centuries, and thus dialogues with the other loggia of the Museum: the one painted with trompe-l'œil pergolas and playful putti, where the portraits of the twelve Caesars are exhibited. It is from these busts that an unexpected buzz of voices spreads. For this occasion the composer and musician Alvin Curran creates a spatialization of whispered words, in Latin and Italian, which gives rise to an improvised exchange between the marble figures.